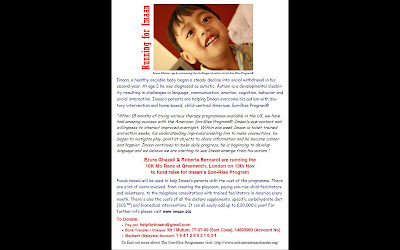 Eju and Roby, are running the 10K Mo Race at Greenwich, London on 13th Nov to raise funds for Imaan’s Son-Rise Program. Please show your support by cheering them on, by donating or simply by spreading the word. Funds raised will be used to help Imaan’s parents with the cost of the programme. This will help pay for the son-rise child facilitators and volunteers and for telephone consultations with trained facilitators in America. There's also the costs of all the dietary supplements and the specific carbohydrate diet (SCD).